This volume includes basic instructions and suggestions on rosemaling but proceeds to a more adventurous spirit to paint on almost anything! Diane Edwards guides the artist toward the freedom to experiment with style and finish. 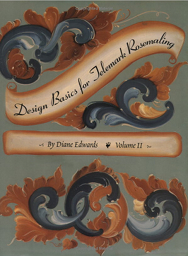 She includes a glossary of rosemaling terms, a helpful list of sources, a quick review of rosemaling strokes, and a useful guide of supplies needed. Includes 12 pages of color illustrations.